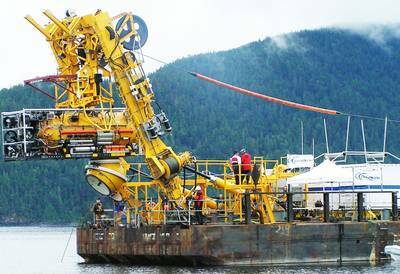 OceanWorks International again receives authorization from U.S. Navy to perform Deep Submergence Systems Scope of Certification (DSS SOC) work. OceanWorks International has again been authorized by the U.S. Navy’s Naval Sea Systems Command (NAVSEA) Note 5000 to perform DSS SOC work in support of designated submarine rescue and intervention systems. The authorization is a renewal of the existing Note 5000 authorization which has been held by OceanWorks International since September 8th, 2011. The authorization is based on OceanWorks International having demonstrated, as verified by regular NAVSEA audits, that its products are constructed and maintained via disciplined work and material control practices, with proper documentation and compliance verification being achieved throughout the certification process. OceanWorks International is one of only 8 civilian and 14 government/ military organizations in the world that have received this elite authorization. Moreover OceanWorks received the highest level of compliance for each section that was audited. OceanWorks International has been working with NAVSEA and the U.S. Navy for many years. As the OEM designer and manufacturer of both the Pressurized Rescue Module System (PRMS) submarine rescue system and associated systems, as well as the ADS2000 Atmospheric Diving Systems, OceanWorks International has played a key role in enabling the submarine rescue capabilities of the world’s largest submarine fleet. “We are very happy to again be granted the renewal of our NAVSEA Note 5000 certification by way of the recent functional audit by the U.S. Navy. Being able to demonstrate that we meet the world’s most stringent quality requirements for something as critical as manned subsea systems for the U.S. Navy is a true endorsement of the hard work we have put in over many years to develop and constantly improve some of the world’s most thorough quality and safety processes”, said Rod Stanley, the CEO of OceanWorks International.